What's the Cost of the Freight Broker Bond? Should I Worry About Bond Claims? Why does an A-rated, T-listed Surety Matter? Freight broker bonds (also known as BMC-84) are required by the Federal Motor Carrier Administration (FMCSA), to ensure that shippers and motor carriers are protected in case freight brokers commit fraud, fail to pay, or otherwise fall short of their contractual duties. If a violation of the bond agreement is established, a claim can be filed against the broker, which will then make them legally responsible to compensate the claimant. The bond ensures that brokers run their business in accordance with all applicable federal and state statutes. The bond does not, however, hold brokers responsible for covering cargo/property damage or loss. 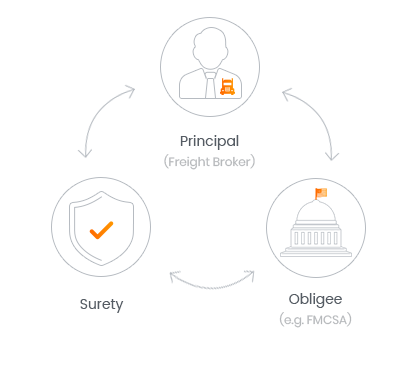 Formerly known as an ICC bond, the freight broker bond requirement was originally put in place in the 1930’s to protect shippers and motor carriers who do business with brokers. In the 1970’s the bond requirement was set at $10,000 where it remained until congress passed the “Moving Ahead for Progress in the 21st Century” Act (MAP-21 for short). The Act raised the freight broker bond amount to $75,000. As with all surety bonds, your personal credit score is the most important factor for the premium you will end up paying. However, a number of other factors can be taken into consideration. We created this freight broker bond cost guide to help you understand all these factors and get an estimate of your expected costs. Alternatively, if you know your personal credit score, you can use our surety bond cost calculator below. Freight broker bonds are valid for 1 year from the issue date. You must pay your renewal premium before the expiration date to avoid having your license revoked. Alternatively, if you wish to cancel your bond, you must give the FMCSA a 30-day cancellation notice using Form BMC 36. Keep in mind that cancelling your bond does not mean you are not liable for violations done prior to the cancellation date. Most people we talk to say, "I run a good, honest business; claims won’t be a problem for me." The reality is freight broker bonds draw the most claims of any class of business we write. Often times it’s not even the brokers fault, but instead an issue with the factoring company or someone not reading the details of their contract. Regardless, a lot of the newer and lower cost sureties have not budgeted to combat these frivolous claims and may cancel your policy even if the claim is not your fault. Preferred markets are in it for the long haul, excelling at identifying issues, recognizing MC transportation exemptions, and communicating with the policy holder. A lot has changed since 2013 when the bond increased to $75,000. Initially all but 2 major sureties bailed on writing freight broker bonds all together as the losses were just too high at the $10,000 level to make taking the risk at $75,000 sound feasible. In more recent years a few new markets have dipped their toes back in the freight broker pool which has reduced premiums for many brokers, particularly the middle tier applicant. Today, we have 8 markets to shop when we receive a new application. While we still try and place as many applicants with one of our original preferred markets for their stability in the freight broker market, superior knowledge in claims handling, communication and stable pricing, we now have more options to choose from when trying to find the best fit for our customers. In addition to the provisions that affect trucking directly, there are also many provisions in MAP-21 that increase oversight of sureties, and particularly trusts, by the FMCSA. In short, they require that financial security consist of assets readily available for claim payment. Personal Guarantees and pledged accounts receivable do not qualify. By placing your bond through an A-rated, T-listed surety we can guarantee our bonds will be accepted by the FMCSA without any issues. Passed on June 29, 2012, and signed by the president on July 6th of the same year, MAP-21 is 599 pages of legislation that includes numerous provisions that directly affect interstate trucking companies and intermediaries. One of the most talked about provisions was the requirement that freight brokers increase the amount of the bond/trust that they post for their license from $10,000 to $75,000. In addition freight forwarders, who were never subject to this requirement, were now required to fulfill this new $75K obligation. Existing companies were required to have the bond in place October 1, 2013. The main reason this provision was so talked about was the fear of what this increase could mean to the “Mom & Pop” or midsized brokerage. Would they be forced out? Would bonding company’s requirements for approval be so high they would not qualify? Would collateral be required for the bond in an amount that cripples the company’s ability to operate? In the end, none of these concerns came to fruition as a handful of options existed prior to the October first deadline. It's important not to confuse the freight broker bond with the household goods broker bond. As of 2012, the latter has been required of houshold goods brokers as part of their licensing procedure. The bond amount is set at $25,000. Ready to Apply? Then simply get a free no-obligations quote, so you can see our low prices! Absolute Beginner in Freight Brokering? Here’s Your Guide!